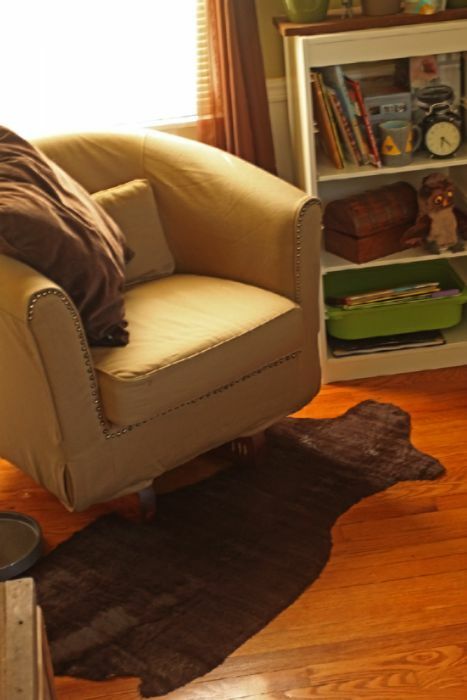 As a part of our nursery, we wanted to add a few rustic elements, like a plush “fur” rug. The trouble was, as it is with a lot of home decor, those things are expensive. Last I checked, little boys are not exactly known for treating their flooring with the respect a $250 rug deserves, so we set out for a cheaper option. I’ve stepped out of the box with rugs before, back when I painted a rug to match my guest room. I figured I could do it again, but this time to start from scratch. That’s right. I made a rug. Aside from the noxious glue fumes (preggo me left that part up to the hubby) it was super easy! The results are amazing, and I would challenge anyone to step into the room and detect that the plush, fuzzy brown “skin” on the floor was homemade by me. So, what are we waiting for? Faux leather or pleather. Something that has some grip. 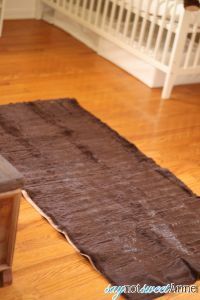 The color isn’t really important, this will become the grippy underside of your rug. Faux fur in your choice of texture and color. I imagine some work better than others here. Being that this rug was so inexpensive, I am willing to chance it not lasting with heavy foot traffic. It sits under a chair anyway. Permanent spray adhesive. The kind that bonds to itself. Marker for planning animal shape. 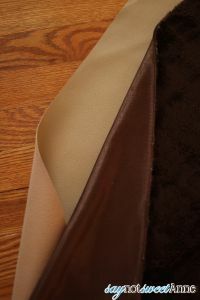 Start by using the spray adhesive according to package directions, to glue the back of your leather to the back of your fur. 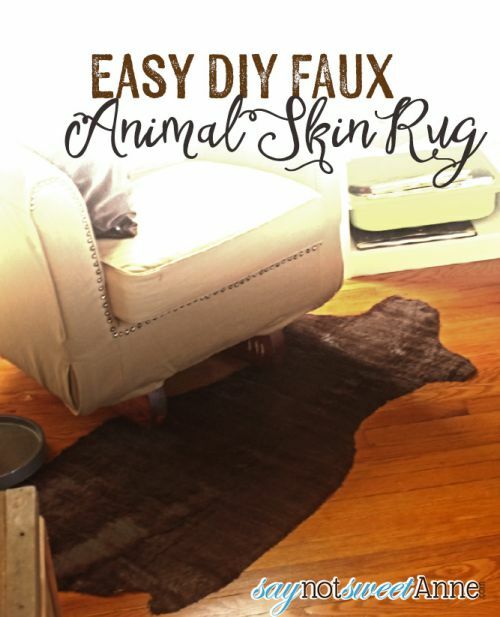 This should leave a grippy leather texture toward the floor, and a soft fur texture toward your toesies. Apply the recommended amount of pressure and allow for dry time. Use the marker to draw out your faux animal shape on the leather. 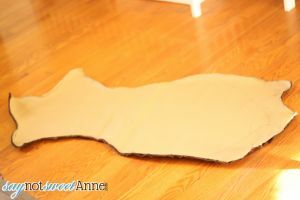 I googled for some animal skin rugs, and then approximated what I think is a good shape. Using the box cutter on a protected surface, cut out your shape from the leather side. Use a lint roller and a vacuum to remove all the stray fur hairs from cutting. That is it! I didn’t finish the edges at all, because hey, its a “fur”. It looks great in the room and feels AMAZING underfoot! 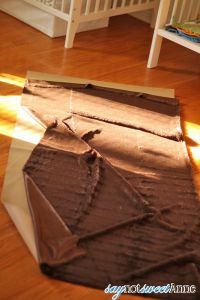 It still has some creases from where the bolt of fur fabric was folded, but I am sure those will relax over time. ← 14 Easy Fourth of July Projects!